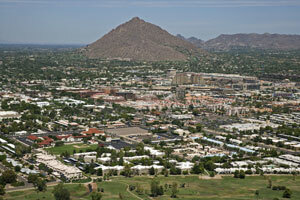 Scottsdale, also known as “The West’s Most Western Town,” is home to over 200,000 residents. Downtown is an art and cultural center where there are many galleries, venues, and museums. Most notable is the top-rated Scottsdale Arts Festival. This creates an atmosphere prime for out-of-home advertising. The amount of venues available for billboard ads also leads to competitive advertising rates. The city also has a combination of high-end retail outlets and independent boutiques permitting you to target whichever audience you want. Your business will benefit from a billboard in the Scottsdale Fashion Square, which is one of the most profitable shopping malls in the Southwestern U.S. Additionally there is the advertising opportunity on State Route 101 where a billboard can be seen by a high number of possible consumers.